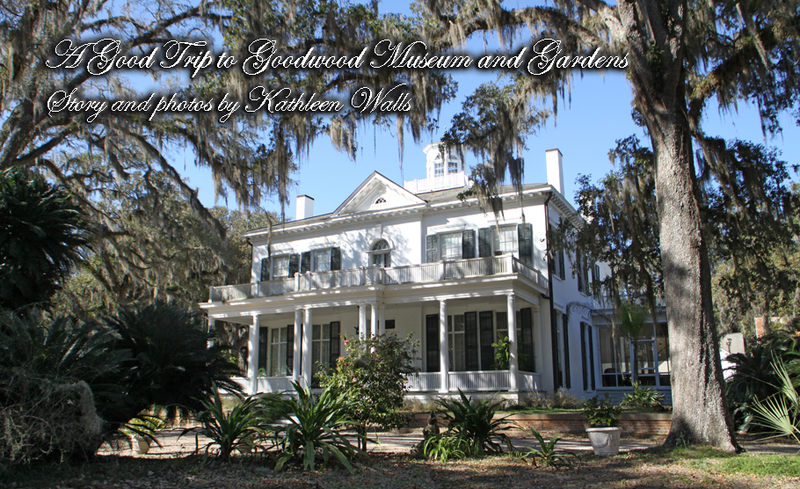 Goodwood Museum and Gardens began life as an elegant cotton and corn plantation near Tallahassee, Florida. It witnessed history, the Civil War which forever changed life in the South, and personal turmoil. A visit there is a fun and interesting trip into the past. 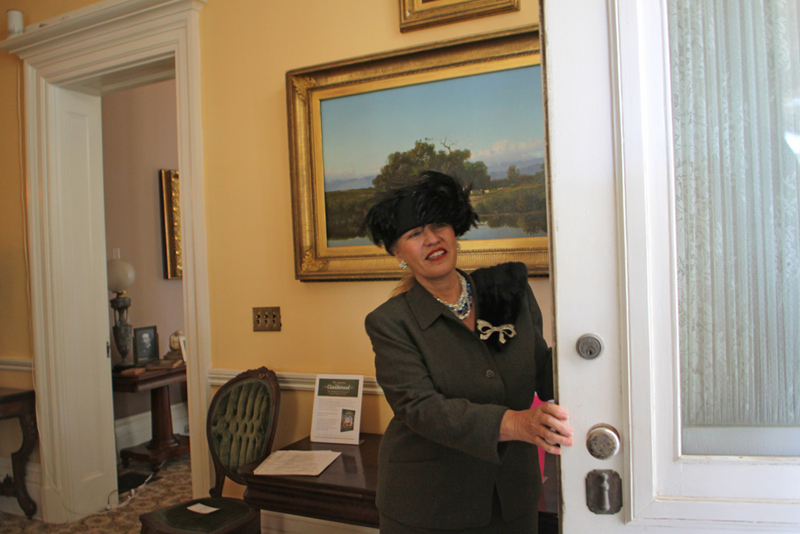 Our docent really was into her role as Margaret Hodges Hood. She made the visit come to life so authentically. She tells how her first husband bought the most expensive bed in history and ended up owning the 1830's Goodwood Estate. But that's getting ahead of the story. Goodwood Estate has roots back n the American Revolution. After achieving its freedom, American gave a large land grant to Marquise de Lafayette in gratitude for his help. Since he planed to return to France, he sold off the land. One of the buyers was Hardy Croom. Hardy had a wife and three children already happily settled in North Carolina. Mrs. Croom did not want to go to the wilds of Florida and settle in a swamp. Mr. Croom promised her he would build her a beautiful home there and since women had little choice then, the Croom family set sail for Florida. Meanwhile he sent his brother, Byran, to oversee the building of a magnificent home. Meantime, one of the many twists of fate occurred. Enroute, the ship went down and the entire Croom family was killed. Bryan Croom continued on at Goodwood until 1857 when he had to sell to Arvah Hopkins to settle a lawsuit by his sister-in-law. 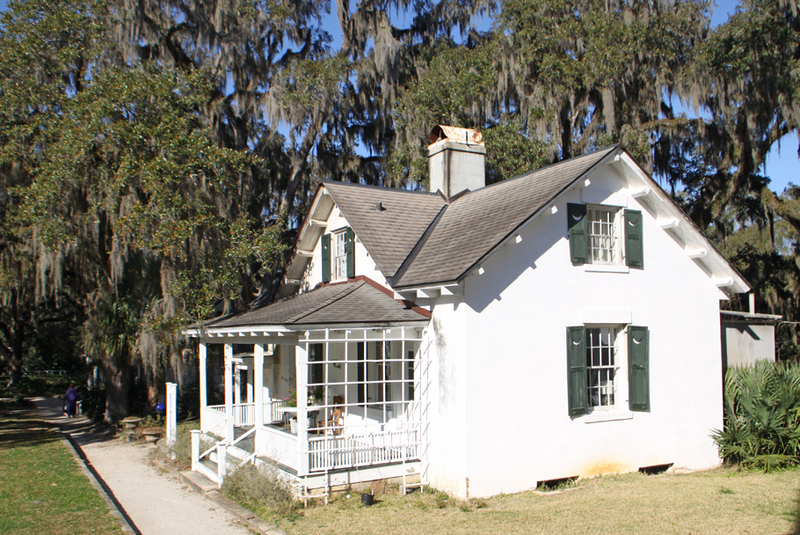 The Hopkins held it through the Civil War years and made it a center of Tallahassee society. Next owner was a strange Englishman by the name of Dr. William Arrowsmith. Our hostess, Mrs. Hodges Hood, confirned that he was "no better than he should be. The woman he arrived in Tallahassee with was not the same wife he had left behind in England." Dr. Arrowsmith died a short time after arriving and his "wife" Elizabeth remained there for 25 years. As a Englishwoman, Mrs. Arrowsmith developed the gardens mush as we see them today.Then in 1911, she sold Goodwood to another wealthy widow from New Jersey, Fanny Tiers. Fanny Tiers is the person we have to thank for the existing home. She put in electricity, bathrooms, a heated swimming pool and tennis court which doubled as an ice skating rink. She brought all her wealthy friends to Goodwood. 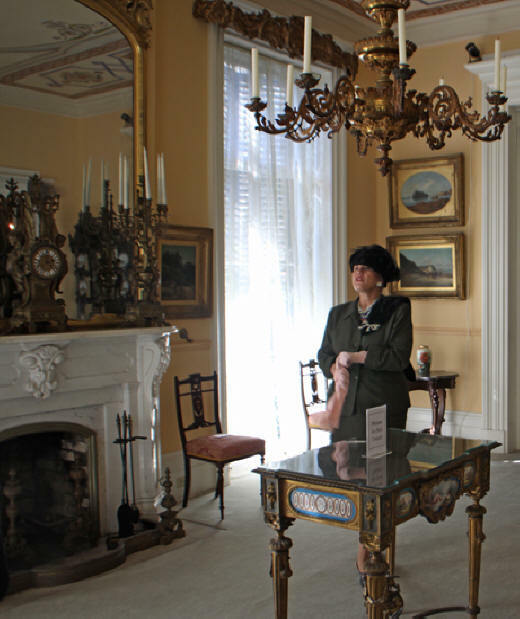 She is the one who renovated the mansion to the current Colonial Revival style. She also built many of the outbuildings. In 1925, Fanny Tiers got bored and wanted to move to Paris. This is where our current "hostess" came into the picture. 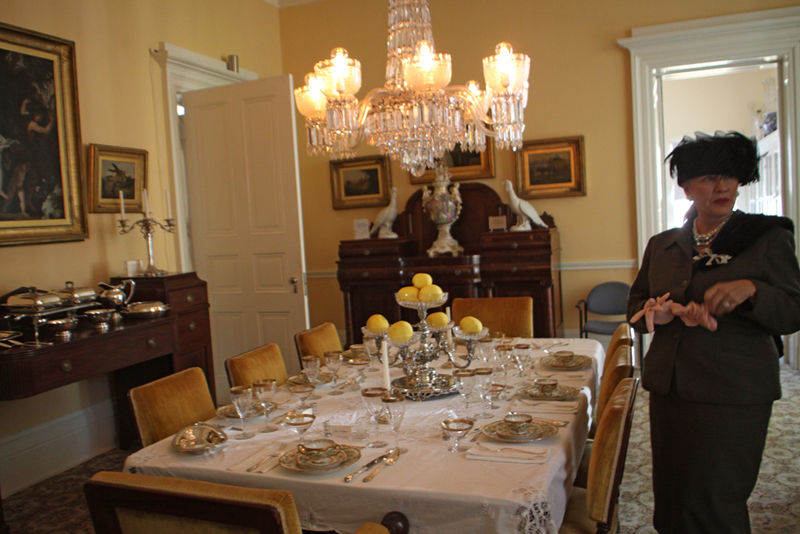 Mrs. Margaret Hodges Hood told us of her romance with her first husband, Senator William C. Hodges. "I was 18 years old and he was 41. I was working downtown at a glove store. He was the handsomest looking fellow. He was a lawyer. He was very educated: very funny and he swept me off my feet. Well, Tallahassee was scandalized." 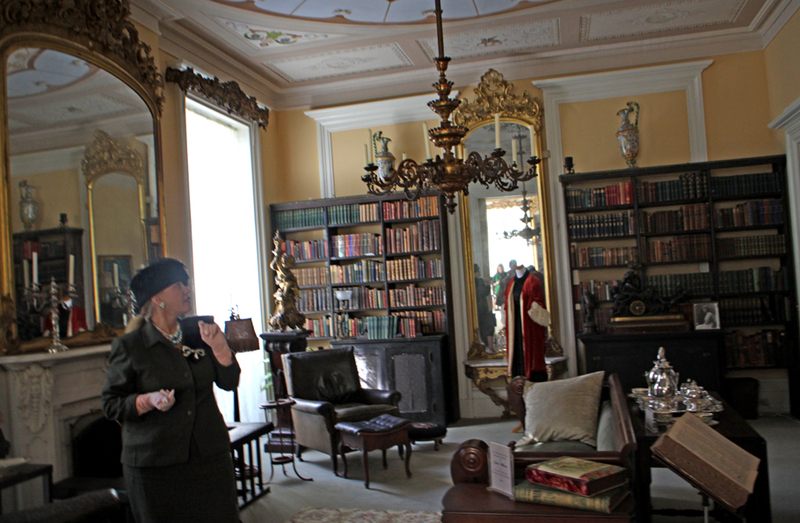 She led us into the home, furnished as it was in her heyday and told us how they managed to buy Goodwood. 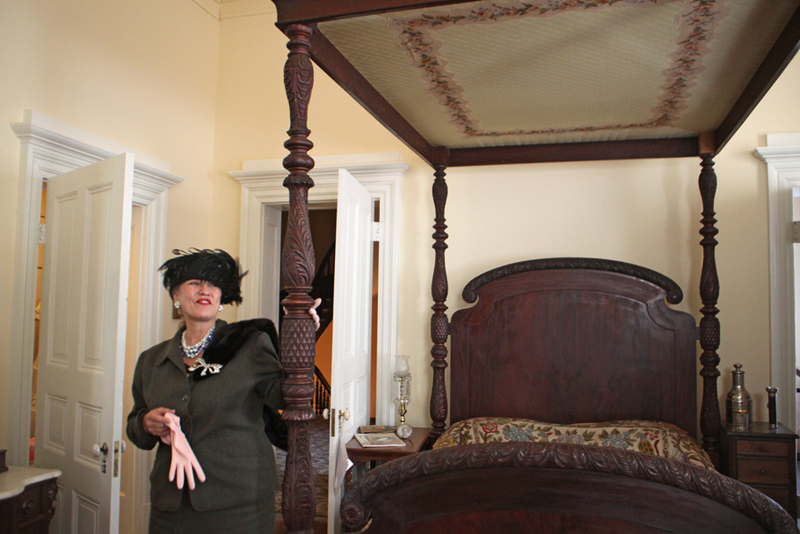 When the Hodges were entertained by Fanny Tiers at Goodwood, there was one bedroom with a special bed that Mrs. Hodges Hood loved. The Senator went to Fanny Tiers in 1925 and asked her if she would sell the bed. Fanny Tiers replied, "No I won't but I'll sell you the bed and Goodwood." That's how the Hodges came to own Goodwood. Mrs. Hodges Hood showed us all her needlework. She was very proud of her talent. She made a lots of dolls and made all their clothes. All the furniture at Goodwood is authentic to the home. There are marble fireplaces in all the rooms. 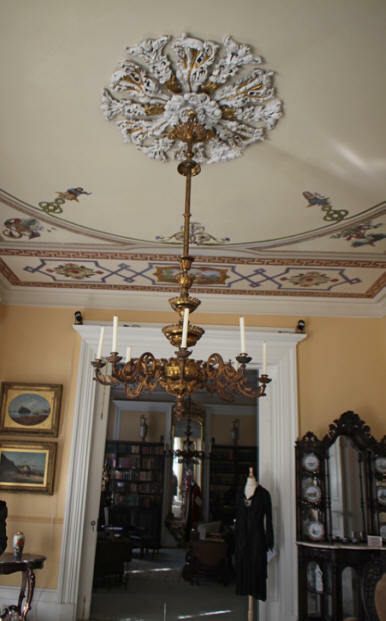 She explained that the parlor ceiling are actually secco, an early form of frescos which were done in tempera. No one knows who the artist was only that he was from Rome. Colors today are just as brilliant as they were when first done over 150 years ago. The mahogany staircase was built in England and assembled by the slaves. Since they could not read or write, but by sheer ability was able to put it together. The story goes that a nephew of the Hopkins had just gotten his Confederate uniform and sword and ran up the stairs leaving a slash on the banister. Margaret Hodges Hood told us that that the home is haunted by children. Probably the children of the Hopkins family. The grounds are part of the tour and include many of the old houses and outbuildings. One was a house built as a temporaty residence while Bryan Croom was building the main house. In spite of the age difference, the Hodges led a very happy life until Senator Hodges death in 1940. To retain her current lifestyle, the widow needed to rent out some of the out buildings. It was how she met her second husband, Major Thomas Hood of the United States Army Air Corp. They married in 1948 and once again Mrs. Hodges Hood managed to shock Tallahassee society. You see he was eleven year her junior. However, she insists, "It was a real love match." Visiting Goodwood is also a real love fest. Do go. You will be entertained in style either by Mrs. Hodges Hood or Mrs. Fanny Tiers.